Use these cables to interconnect equipment which utilizes 68-pin HP DSUB (Half-Pitch DSUB) connectors. These attractive cables feature 68-pin Male connectors on each end, overmolded ends with strain reliefs, twisted pair wiring, and a shielded cable jacket. Thumbscrews secure the cable to the mating connector. Two cable lengths (3 feet and 6 feet) are available. 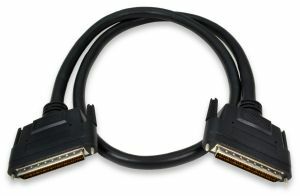 The connector used on this product goes by several different names, including Half-Pitch DSUB, HPDSUB, HPDB68, Micro DB68, .050 DSUB, Amplimite .050 Series, 0.050 D-Type, HD68, SCSI, and SCSI III. 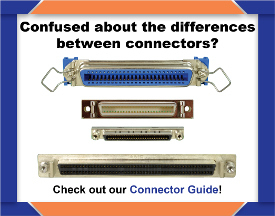 Our connector guide can help to verify the connector family you have. This cable utilizes twisted pair wiring. The pair mapping is as follows: 1/35, 2/36 ... 33/67, 34/68.